After more than a week I am finally back again! Apart from that I started uni and wotking again, which means that now I am busy full-time pretty much. The only day I have off is Sunday- which is why I finally got to write a new post for you today. I am a bit stressed out these days because of all those busy days- I also didn't get to do my homework yet, which is due tomorrow ( or even tonight). So right after finishing off this post I will try and do all of what I was supposed to do during the week. Today I wanted to write a bit about spring, and why I really want winter to be over already. I am a summer person- I need warm, sunny days to feel full of energy and to be happy. To feel a bit better I buy myself bouquets of fresh tulips because they are my favourite flowers and once they are available in shops I pretty much buy them all the time. It kind of makes me feel like spring and summer are just around the corner. 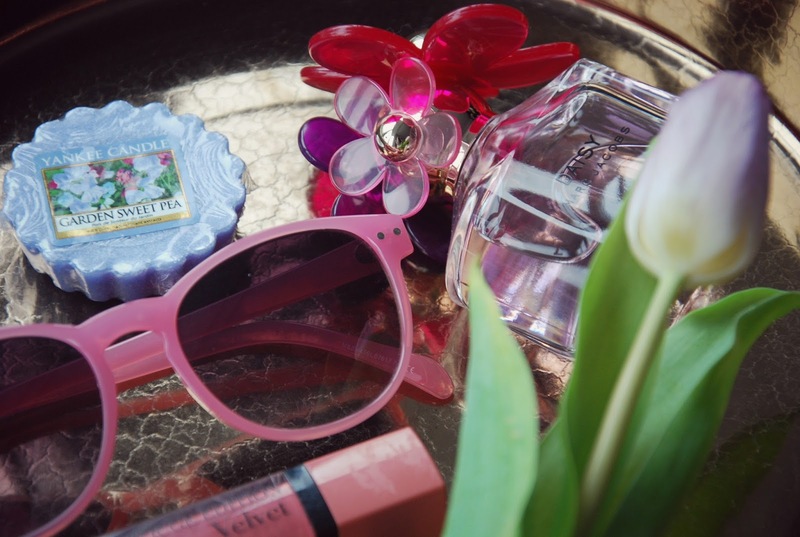 A few other things that make me feel springy-summery is a nice perfume, candles and just summery accessories. I really like my Marc Jacobs Daisy Sorbet perfume- and the fact that it looks beautiful too, makes it even better! Pink lips were my favourite last spring and summer and I think that this Bourjois Rouge Edition Velvet matte lipstick is just great for having long days out, eating ice cream without worrying about the lipstick vanishing in a few hours. I wish that the sun was out more often so that I can wear all my sunglasses out again. (Marks&Spencer had those cool, pink glasses last summer, so I couldn't just go past without buying them.) I also love my black Love Moschino glasses that have tiny red hearts on each side. I also miss going for walks on sunny days with Eryk and Maya, like we used to back in Scotland. I also loved enjoying the sunshine in my garden on warmer days. I am so busy lately that time flies so fast. I don't even know how it's already March?! I mean, it should be warm soon?? Well, looks like I just have to keep myself busy until it is finally warm enough to leave my winter jacket at home and to start wearing cool, fancy outfits again. Do you miss the warm days too?